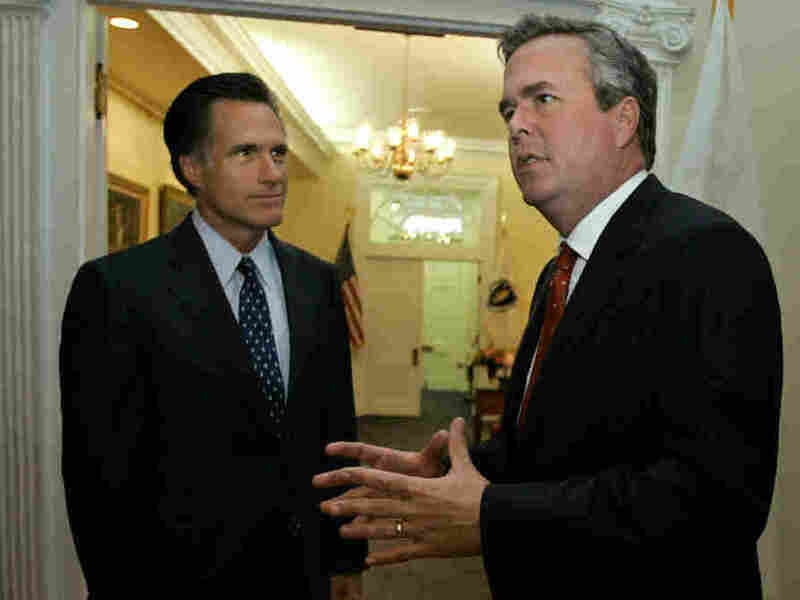 Jeb Bush Endorses Romney : The Two-Way "Now is the time for Republicans to unite behind Gov. Romney and take our message of fiscal conservatism and job creation to all voters this fall," the former Florida governor says. Then-governors Mitt Romney (left) of Massachusetts and Jeb Bush of Florida in 2005. Bush has endorsed his fellow Republican's presidential bid. One day after Mitt Romney's win in Illinois and the talk that has again raised about the former Massachusetts governor being the "inevitable" Republican presidential nominee, he's picked up the coveted endorsement of former Florida governor Jeb Bush. Bush, the son and brother of former presidents, says in a statement released by his Foundation for Florida's Future that "now is the time for Republicans to unite behind Gov. Romney and take our message of fiscal conservatism and job creation to all voters this fall." Bush, who some in the Republican establishment had hoped would mount his own bid for the White House, says he is endorsing Romney because "we face huge challenges, and we need a leader who understands the economy, recognizes more government regulation is not the answer, believes in entrepreneurial capitalism and works to ensure that all Americans have the opportunity to succeed." For ongoing coverage of the 2012 presidential race, check It's All Politics.